This 100% cotton Coccoli two-piece set is going to be one of your favourites. 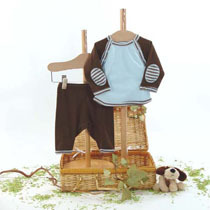 Long-sleeved blue top with brown yoke and striped blue/brown detail matches coordinates with the brown pants. The shirt has a striped blue/brown elbow patch. Adorable.